This is one that, I'm sure, will catch people's attention. The folks behind the original Legend of the Five Rings game have teamed up to bring you a board game set in the 7th Sea universe. Players will take control of one of the warring nations, who have been going at it for 30 years, in order to finally put the conflict to an end. Through the use of diplomacy and force of arms, only one will be able to bring the war to conclusion and rule. 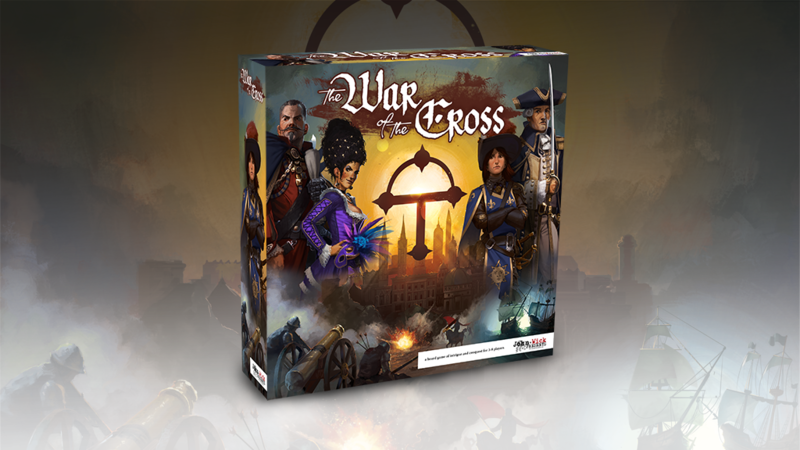 War of the Cross is a four to seven player diplomatic strategy game that tells the story of the last decade of a terrible war that raged across Théah for thirty years. You must muster all your skills to command one of seven Nations to victory in a game of shifting politics, dangerous alliances and tactical skill. Can you lead armies, navies and Heroes to win the day and bring an end to the bloodiest war in Théah’s history? Created by award-winning designers David Williams, Luke Peterschmidt and myself (John Wick! ), War of the Cross unites the original design team for Legends of the Five Rings with the production team for 7th Sea: Second Edition, featuring art direction by Marissa Kelly, layout by Thomas Deeny, and production and development by Mark Diaz Truman. The Kickstarter campaign is up and running now and is set to go for another 33 days.